Conditions were perfect for scoring at Augusta National on Sunday and that set the stage for a scoring bonanza from several players in the field. Nearly two-thirds of the field shot under par in the finale and 10 players posted rounds of 67 or better! Tony Finau’s ankle was clearly not bothering him on his final nine, where he rattled off a streak of six straight birdies beginning on the 12th hole. Cameron Smith also made six birdies on his final nine holes to post a 66 and jump into a tie for fifth. And Paul Casey absolutely dominated Amen Corner, needing only 8 strokes total to navigate his way through 11, 12 and 13, en route to his final round score of 65. However, no one’s final round was more impressive than Jordan Spieth’s, including that of this year’s champion, Patrick Reed. Spieth started his final round nine shots back of Reed, but came roaring back with nine birdies and no bogeys over his first 16 holes! That birdie blitz vaulted the Texan into a temporary share of the lead with Reid at 14-under and positioned Spieth to take a shot at setting a new course record at Augusta National. Unfortunately, Spieth came away with neither a green jacket nor a course record after making a par on 17 and a bogey on 18. Nonetheless, we are certain that fans will be talking about the 24-year-old’s Sunday charge for years to come! Every year, Augusta National’s Par 3 Contest provides no shortage of incredible shots and magical moments, and this year’s competition was no different. At the age of 68, Tom Watson become the oldest winner of the contest after shooting an incredible round of 6-under par on Wednesday. His playing partners, Jack Nicklaus and Gary Player, also turned back the clock for fans, finishing in a tie for fourth and tenth in the event, respectively. The trio hit some spectacular shots throughout the course of the competition, but none was more spectacular than the hole-in-one that Nicklaus’s 15-year-old grandson, G.T., made on the final hole. It was G.T.’s first-ever ace, and it drew the loudest ovation of the day by far! In fact, the moment was so special that it caused his grandfather to break down into tears and say that the shot would go down as his favourite golf memory. Many suspected that the injury would force Finau to withdraw from The Masters, but the 32-year-old somehow played through the pain and shocked everyone by leading the field after the first round! Finau went on to finish the week in a two-way tie for 10th with Dustin Johnson. Two-time green jacket winner Bubba Watson also had some magic up his sleeve on Wednesday. Rather than just tapping in a routine 3-foot putt on the 7th hole, Watson decided to belly-wedge his ball up a slope that was across the green and then watched as it rolled right back into the middle of the cup. It was spectacular! Prior to the Masters, Augusta National’s chairman, Fred Ridley, announced that the club would be hosting an annual tournament for amateur female golfers starting in 2019. The 54-hole tournament will be known as the Augusta National Women’s Amateur Championship, will take place the week before the Masters, and will feature 72 of the top-ranked female amateurs in the world. The first two rounds of the tournament will be played at the nearby Champions Retreat club. The field will then be whittled down to just 30 players, who will compete for the title in the final round at Augusta National. Ridley announced that the event would be televised, which will surely draw some ratings away from the LPGA Tour’s concurrently scheduled ANA Inspiration. But the chairman addressed these concerns by stating that he had already spoken to LPGA Tour commissioner Mike Whan about the scheduling issue and that they had agreed that the tournament “is a win for women’s golf.” Ridley also mentioned that tickets would be available through a random lottery process, which means that fans who have never been able to secure tickets to Augusta National’s hallowed grounds will improve their chances at one day making the pilgrimage—even if it isn’t technically for the Masters! Sergio Garcia’s finest moment as a professional occurred at Augusta National last year when he finally broke through for his first career major victory in a dramatic playoff. Unfortunately, things did not go nearly as well for the Spaniard last week during his bid for a second-straight green jacket. Like most others in the field, Sergio got off to a rocky start in his opening round with three birdies, three bogeys, and a double bogey in his first 14 holes. However, things took a drastic turn for the worse on the 15th hole when he hit five consecutive approach shots on the par 5 that each rolled back off of the green and into the water. Garcia went on to make an octuple-bogey 13 on the hole, which tied him with Tommy Nakajima and Tom Weiskopf for the highest score ever recorded on a single hole at The Masters. As you probably inferred, he did not make the cut. Phil Mickelson got off to a lousy start on Moving Day when his errant tee shot on the first hole came to a rest underneath a fallen oak tree. Instead of taking an unplayable, Mickelson did his best to punch the ball out of the trees with an abbreviated swing. Only, he missed it altogether and smashed his hand on the trunk in his follow through. Mickelson punched his third shot back onto the fairway, missed the green with his fourth, and then needed three more shots from there to finish the hole with a triple bogey. Webb Simpson had the best Masters result of his career last week thanks to a final round 67 that featured consecutive eagle hole-outs on the front nine. The 2012 US Open champion first jarred his approach shot on the 7th hole from 166 yards out and then chipped in on the following hole from just off the green. 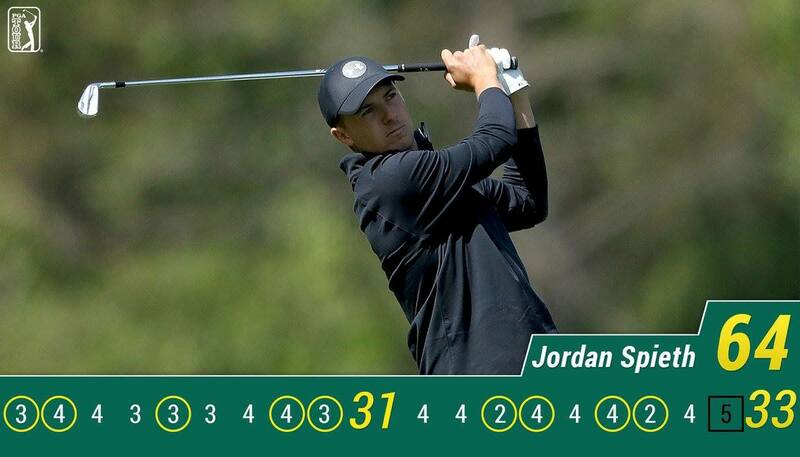 By doing so, Simpson joined Phil Mickelson, Dustin Johnson, and Dan Pohl as the only players in Masters history to record back-to-back eagles on their scorecards. With a green jacket and his first major title on the line, Patrick Reed had no problem finding the bottom of the cup from just outside of four feet. It might not have been the longest putt in the world, but it was as nerve-wracking a putt as they come.